Modern Cat Post Step (1pc). Our newest exclusive ultra-modern design, cat post step shelf is handcrafted using solid hardwood with choice of square or round shape and choice of wood finish. 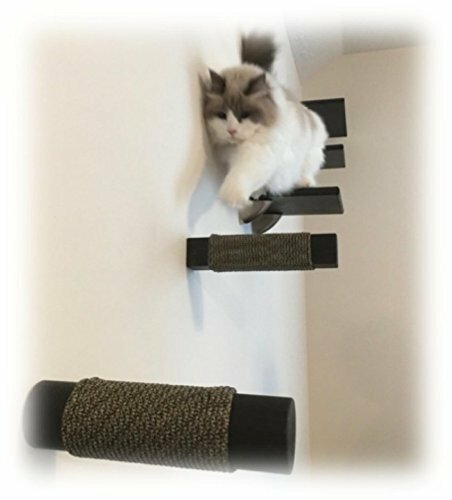 Each cat post step is wrapped in paracord for extreme durability that will not fray like sisal. Create your own cat superhighway. Cat post steps can be installed just about anywhere in a room. Try positioning between cat shelves for extra mobility or create stepping path. Combine several together to create an extreme agility catwalk play space and wall climbing system. Let your cat climb the walls with these stimulating, functional, and space-saving cat post steps. Satisfy your cat's instinct to climb and play. Provide your cat secure activity center high above the ground with these unique cat steps. Create a physically stimulating activity area without compromise to your floor space or decor. Fully assembled, ready to mount into wall studs, for indoor cat use only. Be the envy of your cat loving friends with these exceptionally innovative cat furniture pieces. Create a modern decorative play space you and your cat can enjoy now. Listing is for one (1) cat post step. Free economy shipping included to continental U.S. If you have any questions about this product by Purrfectly Catastic Creations, contact us by completing and submitting the form below. If you are looking for a specif part number, please include it with your message.